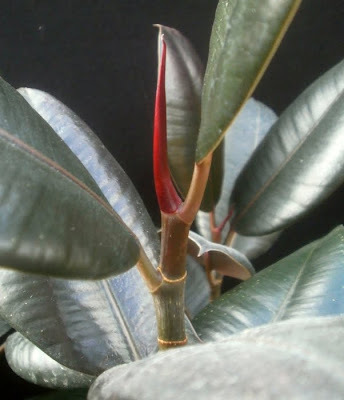 Ficus elastica, usually called "rubber plant" or "rubber tree," hails from the northeast corner of India, south and east into Malaysia and Indonesia. It really has been used in the production of rubber, despite what some websites will tell you, but natural rubber currently comes from a different plant, Hevea brasiliensis,1 in the Euphorbia family (Euphorbiaceae). Hevea brasiliensis, the "real" rubber tree. Photo credit: KENPEI, via Wikimedia Commons, with some cropping and resizing. A surprisingly large number of plants turn out to contain substantial amounts of isoprene, the small molecule which is polymerized to form rubber.2 The two plants you're most likely to have met already are Ficus elastica and dandelions (Taraxacum officinale). People have tried making natural rubber from these, but rubber from Hevea brasiliensis is cheaper and of higher quality. So Ficus elastica is not the rubber tree, but it's a rubber tree. 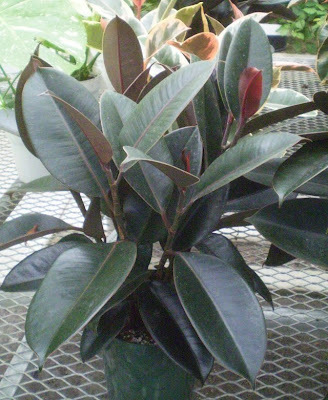 Another "rubber plant" is the one sold as "baby rubber plant." This is Peperomia obtusifolia, and "baby rubber plant" is an unfortunate common name that got attached to it at some point, no doubt by marketers.3 Peperomia obtusifolia is a great houseplant, but it will never grow into a rubber tree, no matter how well you care for it, because it's a different species. (An appallingly large number of websites don't know this. You'd be dismayed, and possibly even sickened.) It doesn't even contain meaningful amounts of isoprene, as far as I can tell. Peperomia obtusifolia. This is the variegated variety, which in my experience is more commonly sold than the plain green one. So now that we've gotten the mistaken-identity stuff out of the way, let's talk about our actual subject. A young Ficus elastica being used as a landscape tree. Image credit: Louise Wolff (darina), via Wikimedia Commons. Resized. As a landscape tree, F. elastica has many of the same drawbacks as Schefflera actinophylla: it's a large, vigorous, fast-growing tree5 which drops a considerable amount of leaf litter and barely-edible fruit, which is a pain to clean up.6 It also produces extremely deep shade, under which few other plants can grow. Outdoor Ficus elastica plants tend to grow wider faster than they grow taller, so the area they take over can be considerable. They also have large, robust roots, which can ruin water lines and sidewalks, and tend to break apart in high winds, both of which make them unsuitable for planting near houses. Which doesn't stop nearly as many people as it should. On the slightly more positive side, F. elastica appears not to be invasive. Different websites give different information, but as best as I can tell, it's been deliberately cultivated in Hawaii and other Pacific islands without becoming an ecological threat (except as a habitat-loss issue; any introduced plant growing in place of a native is an ecological problem to some degree). The general feeling appears to be that it's behaved itself so far but should still be watched closely. The reason for calling F. elastica an "engineer," though, is that it builds bridges. More accurately, people build bridges with it. Big whoop, you're saying. People build wooden bridges all the time. Nothing special about that. Okay, first of all -- damn, you're jaded. Second, what's special and engineer-like about Ficus elastica bridges is that, one, they're built using the roots, not the trunk and branches, and two, they're built while the tree is still alive and growing; i.e., the bridges are alive. And not with the sound of music, neither. The process requires some patience, but it's also elegantly simple. 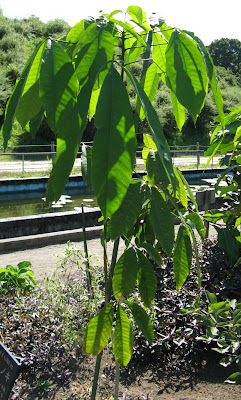 A Ficus elastica tree is located near the spot where one wishes to place the bridge. (If you can find one on the opposite side too, so much the better, but you only need one.) A betel nut tree8 is cut down, and its trunk hollowed out. The hollowed trunk is then placed across the gap one wishes to bridge, and a root from the Ficus is guided into the trunk. The root grows along the trunk until it reaches the soil on the other side, at which point it roots into the soil. Over time, the Areca trunk rots away, the Ficus tree grows, its root thickens, and eventually you have a solid, walkable bridge, albeit one without a smooth walking surface. From the video, one can see that material is added to the top of the bridge to create a walkable surface, and it also appears that people stretch aerial roots from the trees to points along the edges of the bridge, creating what are more or less suspension cables and railings. And then I kind of lost interest in the question, which is the sort of thing that happens to me a lot when I try to read art/literature criticism. So all of that is . . . um, pretty cool, if not terribly relevant to your questions about how to grow a Ficus elastica, right? So let's talk about how to care for Ficus elastica. Many books and websites will tell you that rubber trees do great in low light. Don't listen to those people. Although it is true that rubber trees will survive a few months in a dark corner if they have to, there's more to growing plants than merely failing to kill them.12 Plants receiving inadequate light will drop their lowest leaves, grow larger new leaves, and stretch weak, floppy stems toward whatever source of light they can find.13 Leaves of dark varieties like 'Burgundy' may also turn lighter and greener in color. Rubber plants will benefit from summers outdoors in a shady spot, but if you let your plant vacation outdoors, you should keep in mind that it will probably drop some leaves when you bring it in again. This is just part of being a Ficus, and doesn't mean that your plant is dying, so don't panic: leaf drop should be over after six weeks, possibly well before. 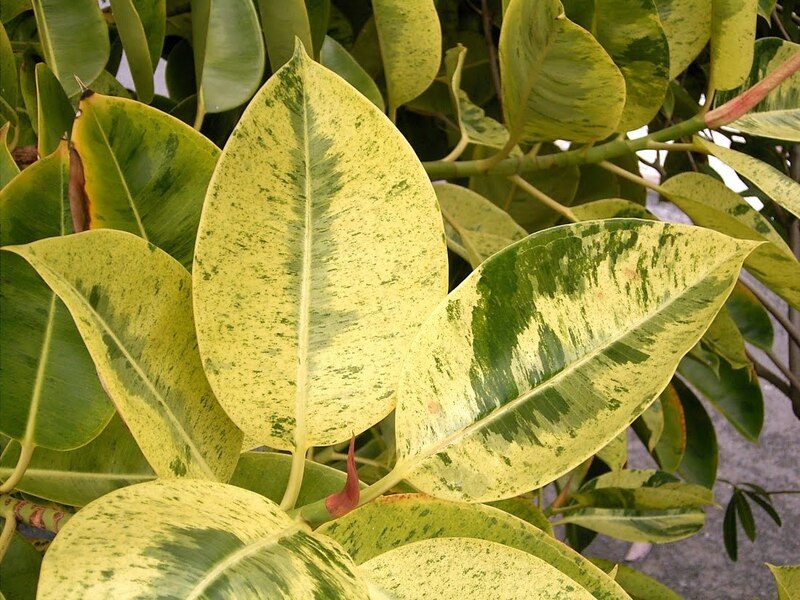 Variegated plants are likely to burn in full outdoor sun even if you try to introduce them to it gradually: keep them in all-day shade, or brief morning sun at most. Ficus elastica 'Tineke' (or similar: several nearly identical variegated varieties exist and I have no idea how to tell them apart). Indoor F. elasticas do best if allowed to dry out almost completely between thorough waterings. 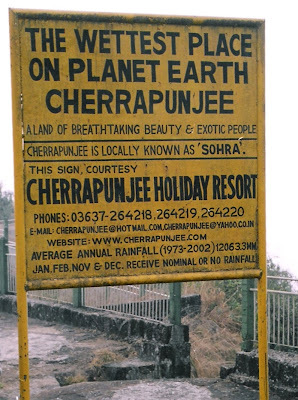 I know, you'd think that a plant from the (alleged) "wettest place on Earth" would be hard to overwater, but that's not the case. Go figure. The rootballs of large pots, especially nonporous ceramic or plastic ones, can stay wet for a lot longer than you'd think, so be particularly sparing with plants in really large pots. The "thorough" part of thorough waterings is important: the rootball will accumulate minerals if not flushed out periodically, and the mineral buildup can affect the plant's ability to take up water. One doesn't need to flush heavily at every watering, but doing so about every six months will help to keep the plant healthy. My Ficus elastica 'Burgundy' as of 23 Aug 2011. HUMIDITY: High humidity is definitely preferred, but they will tolerate dry air when they have to. Don't place rubber plants where they'll have hot, dry air from a heat vent blowing directly at them, though. Misting is not a good idea (see PESTS); if you want to increase the humidity for your rubber tree, it's probably best to group it with other plants, move it to a more humid room, or use a humidifier. Spider mites on a Ficus elastica. PESTS: Personally, I've only ever seen spider mites on F. elastica, but one should also watch for mealybugs and scale. Spider mites are especially likely on plants in direct sun, dry air, or both, but familiarize yourself with the signs and check your plant regularly, wherever it is. 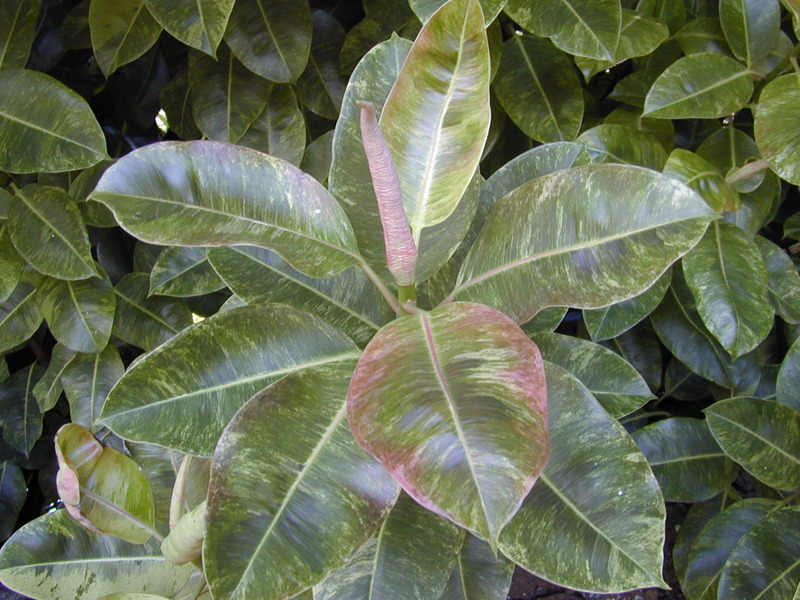 Ficus elastica leaves usually have small white dots near the leaf margins, which are regularly spaced, don't rub off, and may resemble bugs to the uninitiated. These are special cells called lithocysts, which are enlarged cells containing crystals of calcium carbonate. Some other Ficus species have them too, and they're especially easy to see on dark F. benjamina and F. maclellandii leaves.16 I tried to find out what purpose lithocysts might serve, but Google was unhelpful. PROPAGATION: Most sources advise propagating F. elastica by air layering. I've never air-layered anything, but it's easy enough in theory. Check Google. I have, on the other hand, pretty consistently gotten ordinary stem cuttings to take. Get a piece of stem about 4-6 inches (10-15 cm) long, take off all but the last leaf, plant it in damp perlite, place in a warm, bright but sunless spot, and make sure to keep the perlite from drying out. It's best if you can keep the cutting from moving around, too (movement disrupts developing roots). The process is slow, but will go faster with some gentle bottom heat. 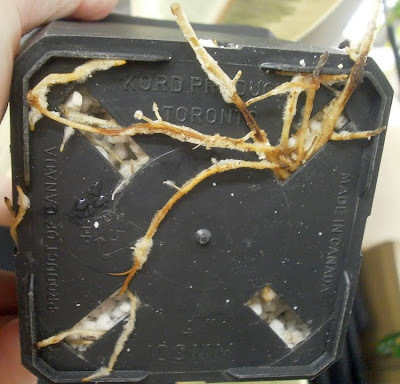 When the plant has roots (evidenced by roots growing out of the drainage holes and/or new leaves), transfer it to soil. When I knew the 'Tineke' cuttings had rooted. Cuttings don't necessarily need to have a growing tip in order to work; my F. elastica 'Tineke' came from a single cutting I received in the mail. I cut it in half and planted both pieces in perlite. The piece that had been the bottom grew a new growing tip, and is now actually taller than the piece that had a growing tip already. My 'Tineke' cuttings, rooting in perlite shortly after I received them. The piece without a growing tip is on the left. 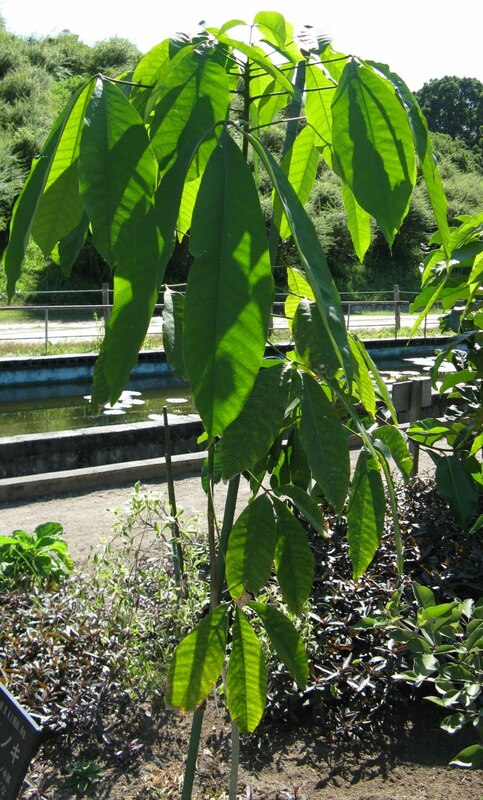 Rubber trees can be propagated from stem cuttings containing only a single leaf; a good post from someone who's done this can be found here. Some people claim to be able to root Ficus species in water, but this has never, ever worked for me (and I've tried it a lot), so I don't recommend it. I've also seen people recommend planting cuttings directly into soil, but that tends to lead to fungal problems and kill the cutting, at least indoors. Though planting directly into soil has worked for me at least once. Most commercial production of rubber plants is now from tissue culture, which is either impossible to achieve in the home or merely very, very difficult, depending on whom you listen to. 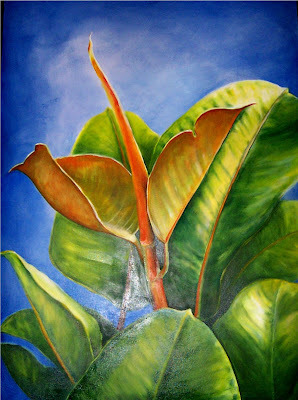 My NOID Ficus elastica as of 23 Aug 2011. GROOMING: Growers treat rubber plants with hormones to keep them compact and bushy. When the hormones wear off, as they will after a few months, the plants will begin to stretch. This is particularly an issue if the plant is being grown in low light and/or overfed. Short of treating the plant with growth retardants yourself, there really isn't a lot to be done about this. Placing the plant in a bright spot will reduce the extent of the stretching, as well as improving the plant's health in general. The developing leaves emerge from the top of the stem, clothed in a protective sheath. In some varieties, the sheath is bright red just before the leaf unfurls, then dries up and turns brown. I've seen people on-line mistakenly refer to the sheath as a "flower:" this is understandable, because of the color, but wrong. Plants that are about to hit the ceiling and are otherwise healthy can be cut back and will sprout a new growing tip. If you're very lucky, they'll resprout two, but let's face it, you're probably not that lucky. (Plants that get to spend some time outdoors, and have been properly acclimated, are much more likely to branch when cut back.) If you're just trying to bring one unruly branch under control, you can cut it back at pretty much any time; if you need to do more radical pruning, it's best to wait until late spring or early summer. There's no real trick to making the actual cut: just use a sharp, clean knife or pair of shears or whatever, and cut. The new growing tip will emerge pointing in the same direction as the new topmost leaf, so avoid cutting above a leaf that's pointing out away from the plant unless you want that stem falling over all the time. Don't prune plants that are doing poorly, as this will stress them further. The sap is capable of staining fabric and furniture, so people usually recommend putting down newspapers or plastic or something before pruning. Rubbing alcohol is rumored to remove dried sap from skin and/or fabric. As with Euphorbias, rinsing cut ends in cold water will slow or stop sap-bleeding. Even without cutting a plant back, though, one can still see occasional spontaneous branching. This plant has branched a second time from the base since this photo was taken. Like all Ficus species, F. elastica has a vigorous root system (hence the bridge-building). Although plants will survive being extremely potbound,18 if you want your plant to keep growing, it's best to move your plant to a larger pot when roots start poking through the top of the soil, or you notice your plant drying out more rapidly than it used to. 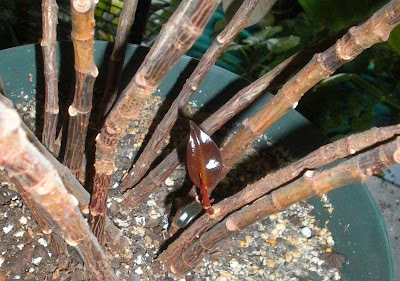 If you want to keep your plant in the same pot, you can root prune: take a sharp, clean knife and cut the root ball from top to bottom, about an inch (2.5 cm) deep, then repeat about every six inches (15 cm) around the outside of the root ball. Work the roots free with your fingers, discard any root pieces that have been severed, then re-pot into the same container with new soil around the root ball. This carries some risk of fungal infection (for the plant -- if you get a fungal infection from this then you've done it incorrectly), but my experience at work was that all species of Ficus breezed through the ordeal, then began a new flush of leaves shortly afterward. Aerial roots (small, threadlike roots that emerge from the stem above the soil line) are a fairly common development on indoor plants, but not so common that I could find some in the house to take pictures of. (Sorry.) In dry air, aerial roots tend to wither soon after they appear, and it's no big deal to remove them. Plants in moister environments may hang on to their aerial roots, which some people find unattractive. If that's you, yes, you can clip off aerial roots whenever you see them, and the plant will cope just fine. FEEDING: F. elastica doesn't have very high nutrient needs under normal indoor conditions. So yes, you should feed, but no, you don't need to get carried away with it. (You might even want to hold back on fertilizer to try to stunt your plant's growth, if it's threatening to hit the ceiling.) I've seen nothing that leads me to think that nutrient deficiency diseases are particularly likely in rubber trees. 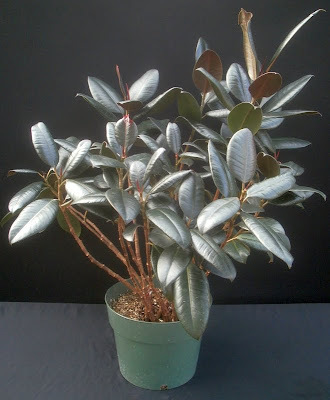 Ficus elastica 'Shrivereana.' Image credit: Frank Vincentz, via Wikimedia Commons. Resized, color slightly tweaked. 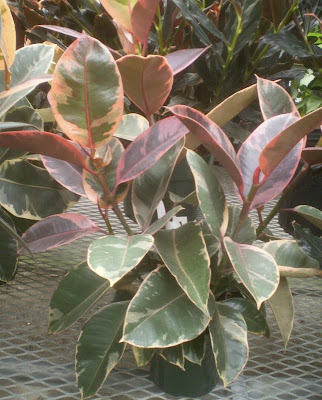 Ficus elastica cultivars have many, many names, which is not surprising for a plant that's been grown for over a century, but they fall into a handful of broad categories: there are the green ones (e.g. 'Decora' and the species), the red/black ones ('Burgundy'), and the white/pink/green ones with blotchy variegation ('Tineke,' 'Sylvie'). I've seen pictures occasionally of varieties with speckled cream/green or green/green variegation, like 'Shrivereana' above, but I've never seen one in person. I also only know a yellow-margined green variety from photos. All varieties grow pretty much the same regardless of color, though the blotchy variegated ones are a bit slower and are more inclined to sunburn. 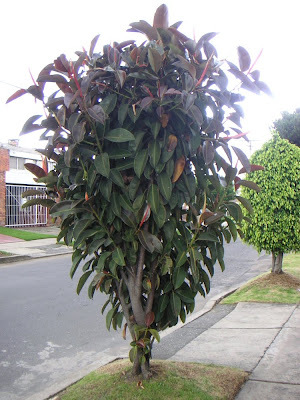 Around here, most of the Ficus elasticas I see are relatively large specimens of 'Burgundy,' generally in 8-10 inch (20-25 cm) pots and about three feet (0.9 m) tall. They're ridiculously popular choices for condolence plants. 'Tineke'-style variegated plants are usually sold in 4- to 6-inch pots (10-15 cm), and I almost never see green or speckled rubber trees for sale, even though I'd love to have a speckled rubber plant. 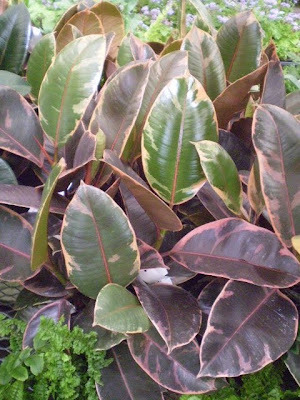 Ficus elastica 'Decora Honduras.' Image credit: Forest & Kim Starr, via Wikimedia Commons. Rubber plant toxicity is difficult to get a handle on; I'd always assumed that it wasn't that bad, since it was so commonly-grown and so rarely warned about, but it actually is a little dangerous. Allergies and skin irritation appear to be the most common problems, and persons with life-threatening latex allergies or extremely sensitive skin should maybe not try to grow this plant.19 Like Ananas comosus, the sap contains a protein-digesting enzyme (a protease, in the jargon) called ficin-E, which may be responsible for some of the skin irritation. The sap is more dangerous by ingestion; stomach upset (not specified, but I assume we're talking some combination of nausea, vomiting, and diarrhea) is the most likely outcome. As a rule, toxic reactions are worst in organisms with smaller body weight, so I would definitely not put this plant within reach of a bird, cat, or small dog, and the leaves bleed sap readily enough that I wouldn't trust the plant with young children either, at least not until they outgrow the put-everything-in-the-mouth stage. Leaving aside the toxicity, F. elastica is a decent houseplant. I certainly have more respect after learning about this whole bridge business. They do seem to place a high value on consistency, like other Ficus species do: if you don't make any sudden changes (especially with regard to light and temperature), you should be fine. You're not going to grow any bridges, probably, but unless your house is a lot bigger than I think it is, you probably don't need any, either. Photo credits: my own, except as otherwise noted in text. Isoprene structure is public domain, from Wikipedia. 1 Hevea brasiliensis is in the Euphorbia family. As far as I'm aware, it's not used as a houseplant in temperate climates, though in Googling around, I did find evidence that they're grown in containers in Southeast Asia (see KENPEI's pictures at the bottom of the linked page), so probably someone out there has tried it. 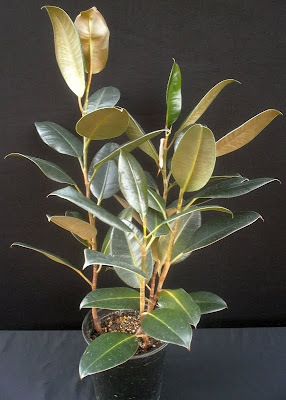 More commonly, Googling "hevea brasiliensis houseplant" gets you pages where Ficus is discussed under the name Hevea. Like for example this one, which is kind of depressing. Sometimes I think people don't even try to get the details right. Polymerization is when multiple molecules of isoprene react with one another to form a long chain of atoms with a repetitive structure. It's sufficiently technical and complex that I can't really take the time to explain exactly how it works, but that's the basic idea: a bunch of small roundish molecules (isoprene) become single, long, chainlike molecules (rubber). (EDITED:) Isoprene can be obtained and polymerized without involving plants at all (which is delightfully referred to as "synthetic natural rubber"), but actual natural rubber's polymerization is all done within and by the plant itself, from a slightly-modified version of isoprene. (Read about IPP and DMAPP if you're interested.) 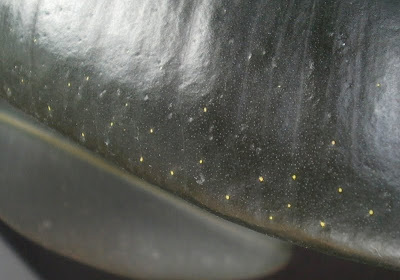 The human contribution to natural natural rubber lies in extracting the tiny rubber globs from the sap of the plant, then washing, filtering, pressing, and stretching them into a useful product. 4 "Pine straw?" Does that mean pine needles? And if so, why not just say pine needles? Is it a regional thing? 5 I'm not even going to try to put a number to the maximum height. 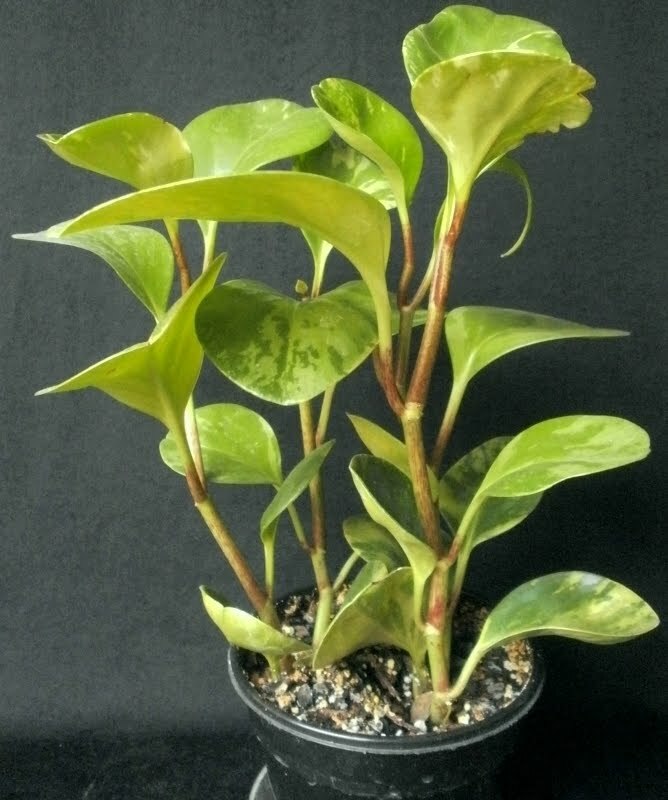 I ran into websites claiming a maximum height of anywhere from 1-2 feet (0.3-0.7 m), which is clearly wrong and possibly refers to Peperomia obtusifolia, all the way up to 200 feet (61 m). No doubt the correct value is somewhere in between there, but damn. 6 Like other species in the Ficus genus, F. elastica produces figs, which are hollow and lined inside with the flowers. They can only be pollinated by a specialized species of wasp; the seeds are then spread in the droppings of birds and other animals who eat the figs. 8 Technically there is no "betel nut tree." "Betel nuts" are the fruit of the palm Areca catechu, wrapped up in a leaf from the betel vine (Piper betle), generally with lime (mixed calcium oxide and calcium hydroxide) added. From what I read on-line, both the vine and the palm fruit are stimulants, but the Areca fruit is responsible for most of the psychoactive effects; the betel leaves seem to be there mostly as flavoring. I didn't examine this particular aspect that closely, though, since it's not directly relevant to the Ficus, so if you're interested in this you should probably look elsewhere. My point is that "betel nut tree" should be understood to mean the palm Areca catechu, even though the fruits of A. catechu by themselves are not sufficient to create a "betel nut." The room is cheerfully lit, although the source of light is hidden from us. It is the natural light of the Socialist Realist bright future. In the center is a middle-aged woman with a war medal, proud mistress of the new apartment, who seems ready to break into a Russian folk-dance. Nearby is her son, an exemplary boy and young pioneer. A portrait of Stalin takes the place of a father. 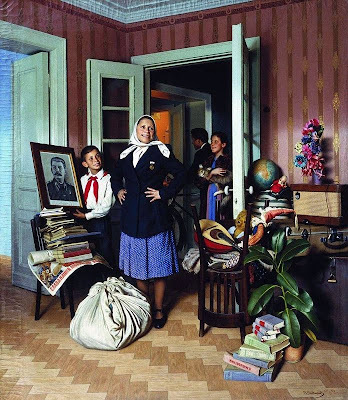 The gazes of this Soviet family do not meet; the mother looks into the audience as if inviting our approval, the son looks up to his proud mother, and Stalin looks in the opposite direction, as if watching us through the half-open door, guarding the limits of the visible. The scene appears to belong to some familiar totalitarian sitcom: the characters wear appropriate Soviet uniforms and freeze in the established theatrical poses known from films and paintings, as if waiting the predictable prerecorded applause. A few neighbors with whom the family will share the communal apartment gather at the door, jolly smiles frozen on their faces. The furniture in the room is very sparse and the private objects are limited to books, a radio set, toys, a political poster, a globe with the largest country of the world usually colored in bright pink, a balalaika, an a sickly-looking rubber tree plant (Fikus) in the foreground. I totally get the sitcom aspect (the woman in the center has a very Rhoda-Morgensternish quality to her, I think), but I think calling the Ficus "sickly" is uncalled for. (One yellow leaf is all! That's not "sickly!") It is essentially a propaganda painting: Wikipedia notes that Laktionov was known for portraying happier images of Soviet society than most people would have actually experienced on a day-to-day basis, which may have something to do with why he had a better career than most artists of the time: telling the powerful what they want to hear is a time-honored and well-trod path to success. 11 It's one of my five favorite books, in fact. This is at least partly because I read it at when a young and impressionable college student, but I re-read it recently and it holds up a lot better than some of my other favorites, so I'm left to conclude that it's just a good book. 13 There are other reasons one might see leaf drop (see WATERING) or stretched stems (see GROOMING), but if you're seeing both at once and the plant isn't in a bright spot, inadequate light is likely your problem. 15 If you're getting the impression that pretty much everything causes rubber trees to drop their leaves: um, you're not wrong. 16 According to my source, all Ficus species have cystoliths, but when I examined my own plants, I couldn't find any on F. lyrata, F. microcarpa, or F. pumila. 17 Interpretation: Ms. Smith is apparently a sorceress of some kind who dislikes Trey Anastasio and co., and has utilized cystoliths in the casting of a spell which gives her at least six wishes. One of the wishes is that the members of Phish be told an untrue story (number five in a series of stories) involving a dish, a story so incomprehensible or outrageous that it will destroy not only their brains but also their spinal columns. The moral, obviously, is to keep Trish Smith away from the Ficuses and/or improvisational musicians. And yes, I know this isn't as good as Nana Anna's anise 'n' Ananas nanus cookies, but it's at least longer and harder to say. 18 Seriously, some of the plants we sold at the garden center had rootballs that were like 90% roots and 10% soil. They needed water all the time, but as long as they got that, they were fine. 19 I'm erring on the side of caution. It's not clear to me that people with latex allergies (who are, I'm assuming, allergic to natural rubber from Hevea brasiliensis) would automatically also be allergic to the sap of Ficus elastica, and as I said above, there are a lot of websites who think that Hevea brasiliensis and Ficus elastica are the same plant, so it's hard to put too much stock in some of the warnings. However, Ficus species do tend to be more allergenic than plants from other genera (F. benjamina is a problem for me personally, though it's not so bad that it keeps me from growing them. ), and if you've had a severe reaction to natural rubber before, you may as well not chance it. It's not like you don't have other options for indoor plants. Contact with the leaves of the common fig can cause bad skin irritation, especially when harvesting in strong sunlight. Even in the south of Spain they wear long sleeves and even gloves. I can't wait to read this properly rather than skimming while I get ready for work. Wow! Wonderful article! No wonder it took you so long to write it. Bravo, mr_s, bravo! It was well worth the wait. It's true what you said about the name of the baby rubber plant. The marketers obviously should have called it "rubber baby plant," it would have sold much better. And I want a speckled rubber tree, too! And you're reminding me that I took pictures of the air layering process about a year ago, and still haven't written that post. Oops. Those bridges are amazing! And really, 15-20 years is shorter than lots of bridge projects that are undertaken by humans. This gets my star of approval for coolest thing I've seen all week - maybe all year. Seriously, this is cool. I've successfully rooted a Ficus elastica 'Burgundy' in water, mostly because I didn't know any better. It took forever to form even the smallest roots. He became much happier when I transferred him to soil. Now he's in an East-facing window and growing like crazy. Every rubber plant I've ever tried to grow has succumbed to mealy bugs no matter how carefully I take care of them. I give up! It's going to join the Snake Plant on my list of "Plants that Just Don't Like Me"! Those bridges are crazy! I kind of want to go see them now...but I don't think India is in my future any time soon. As for the green and yellow variety if it looks like this: http://www.flickr.com/photos/tom2643/5864667645/in/photostream it's probably actually F. altissima. I don't actually know what the difference is between the two but I'm guessing it has something to do with the fruit. "Rubber baby buggy plants" would also be fun, but would probably not sell well. Sounds sort of like me with Marantas and Saintpaulias. Well, probably you shouldn't. The main source for the ethylene stuff was the Griffith book, and he's looking mostly at large-scale production. F. elastica is more sensitive to ethylene than a lot of other indoor plants, but I have no real sense of how much ethylene would be produced from a bowl of fruit as opposed to a waterlogged pot of soil or a leaky natural gas line, so I don't know how big of a deal it would actually be to the plant. So, keeping any fruit and particularly bananas in the same room as a rubber plant is a bad idea? That explains a lot. I would trust Flowers of India for the final height of 30-40 metres, even if they can't spell elastica. Betel nuts are the nuts used with betel leaves. Betel nut is a commonly used but etymologically dodgy western name for the areca nut (Areca catechu palm seed) because it used with the betel leaf. It is probably better to use one of the native names such as supari. Paan is the most common name in India for the confection of the two which usually also contains many other flavourings, sweetenings, diluents, slaked lime and often tobacco. Using the phrase "betel nut" for paan is definitely not correct. Perhaps it is not strange how many drug names are confused and confusing. Thanks for that! just bought a F. Elastica "Burgundy" home and am completely in love with him. He is about two feet at present, hoping to grow him fairly large - six feet or so. any advice as to how long this could take him, if repotted yearly? He is indoors in good, but indirect light. It's really impossible to answer very precisely. It'll take longer than "months" and not as long as "decades." I don't repot every year, and one plant's gone from about 1.5 feet to 3 feet in 5 years; the other has taken 4 years to go from .75 feet to 1.5 feet. For a lot of that time, though, I wasn't fertilizing adequately, so they could probably have grown faster than that. I grew up when rubber plants were really fashionable inside in the 70's. Sadly, in Queensland they are an abnoxiuos weed that is listed by the government. So, for the environmentalists, not a great plant to grow! Hi - am a plant newbie, so excuse what is likely a stupid question ... if the plant is outdoors - to keep its root system contained, would it be enough to keep it pruned to a limited height? This is really way out of my area of expertise, so take that into account, but my gut instinct is that no, the roots will keep growing unless you cut the plant back severely and regularly -- so severely and regularly that you may as well not even have a plant, since you won't see it much or often. Even if the roots did stop growing at some point, I'm not sure it would help: two meters seems awfully close to the house. Thanks, Mr Subjunctive, for your thoughts - I will err on the side of caution with this one, and find the plant a big self-watering pot that it can't escape from ... hopefully. I've had a medium-sized hand-me-down "Burgundy" for 10 or 12 years. She's been a real trooper, as I'm a total amateur, and has withstood several rounds of re-potting and pruning. 5 of her 6 pruned branches have even successfully rooted in water (which I too tried because I didn't know any better), and grew up to be healthy individuals. However, about a year ago, this mama plant took a bad turn. Instead of strong, healthy, dark, shiny leaves, her new growth is comprised of weakly green, stunted, small, soft, even spongy-looking leaves. The worst couple of the new leaves are spade-shaped, not the full-round oval I'm used to seeing. The new sheaths sometimes wither and blacken before a new leaf even comes out. The new stems toward the base of her main trunk are thin, and some have produced only a few tiny leaves before shriveling up and turning black. There are no spots on the leaves or other discoloration though. And the healthy branch keeps going as if nothing is the matter. She hasn't been taking in water very much, and I suspected root rot or some sort of soil-borne pathogen, so at the end of the summer, I dumped out the soil that was in her pot, washed out the pot and repotted her in new soil. (I didn't wash off her roots, which I probably should have done.) I have never been a frequent waterer, but I backed off even more in the last 6 months. She has filtered southern sun exposure and I made sure she's away from heat vents and drafts—and she's quarantined away from the other plants. Your article inspired me to look for signs of spider mites, and I did find a few scant little webs, and one of the healthier leaves had debris underneath, so I started a fan in her room. Could mites be responsible for all of those symptoms? Do you have any other suggestions? Anything you can think of is greatly appreciated, and if you would like to see pictures, I can provide some! Working on a response to your e-mail message; short version is that I don't know, but if forced to guess, I'd guess a root/stem rot caused by bacteria or fungus. Some nutrient deficiencies (of manganese, iron, zinc, or boron) can also cause problems somewhat like you describe. Hi I am a total newbie to houseplants and seem to have overwatered my rubber plant. The leaves are drooping and some have fallen off. Is there anything I can do to save it? it has been looking sorry for itself for a few weeks now. If you're sure that overwatering is the cause (as opposed to cold damage, root rot, or some other thing), the best thing to do is to stop, and water correctly from here on out. If you feel like you've already stopped overwatering, and the problem has continued to get worse, then there are three likely explanations: one, root rot; two, you think you're not watering too much but you're totally watering too much; three, you've overcorrected, and are now underwatering the plant. I would move it before it takes off and put it as far from any structures as possible. Ive had mine for 15 years and its now over 120 feet tall and still growing like crazy. Its about 60 ft. From my house and the roots are at my walls. Im concerned that they may reach the neighbors and now wish I had planted it elsewhere I just never expected it to get so huge. My neighbor has a huge old oak tree and it is dwarfed by the ficus elastica. Never read an article on Ficus elastica that was so informative and so readable, both things at once. And I thought I had read nearly every page you wrote here, been enjoying it so long now. Are you still looking for a pic of an indoor ficus with air roots? Mines on a north facing kitchen window by the sink and it's started to go a little crazy! Thanks for the offer, but the article's been written and up for seven years now; apparently an air-root photo wasn't as critical as I thought. I didn't think it was since I'm sure that you would've found one by now but I thought I'd offer.